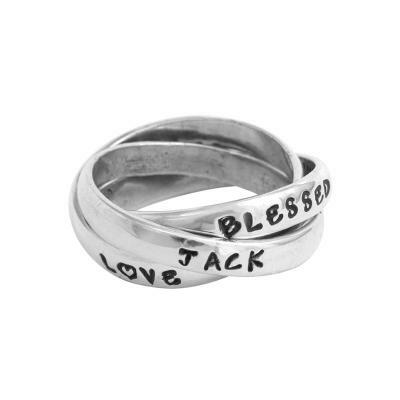 "Grandmother's Ring with Names Silver, Personalized for Mom of one, Triple"
Grandmother's Name Rings are the perfect accessory for a grandmother of one. Put the child's on one band and then put the birthdate, your grandmother name or leave it blank to add more later! Customize it any way you want. Ideas for stamping: first name, middle name, birthdate or make it a family ring with you, your husband and child's names. You can dedicate the ring to your grandchild by putting their name, birthdate, middle name, nickname, "my angel", "blessed", etc.